Heat oven to 350°F. Spray 13 x 9-inch (3-quart) baking dish with cooking spray. In 10-inch skillet, heat 2 tablespoons olive oil over medium heat; add 1 yellow onion, diced. Season with salt and pepper; cook about 5 minutes, stirring occasionally, until onion starts to brown. Add 1 1/2 lb ground beef; sprinkle with more salt and pepper. Cook 5 to 6 minutes, stirring frequently, until browned. Stir in 1 jar (25.5 oz) Muir Glen™ classic marinara pasta sauce; heat until warmed. Cook and drain 1 lb spaghetti as directed on package. 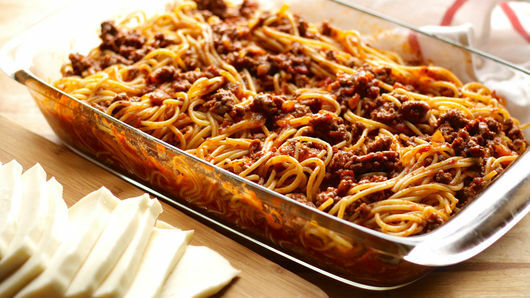 In baking dish, mix cooked spaghetti and pasta sauce mixture. Top with 1 lb sliced mozzarella cheese. Bake about 30 minutes or until bubbling and cheese is melted. If desired, set oven control to broil last 1 to 2 minutes until cheese is browned. Top with sliced fresh basil leaves for serving. If broiling, be sure to keep a close eye on the dish so the cheese doesn’t burn. Just when you thought you couldn’t love your 13x9 pan any more than you already do, you found out it could make one of your favorite dishes for you! 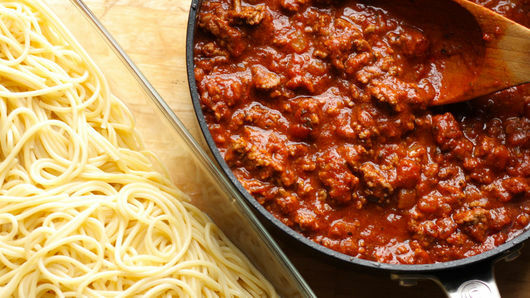 Yes, it’s true—spaghetti can be cooked in the oven, over the stove and in your slow cooker, but while those are all tried-and-true methods, what we love about baked spaghetti recipes is that you can prep the dish the night before and then it’s ready to pop in the oven around dinner time! If you want to make it ahead of time, follow all of the steps except for putting it in the oven. Once your ingredients are in your casserole dish, cover the dish with foil or a tight-fitting lid and then keep it in the fridge overnight. When you’re ready to make it, preheat your oven and throw it in. See? 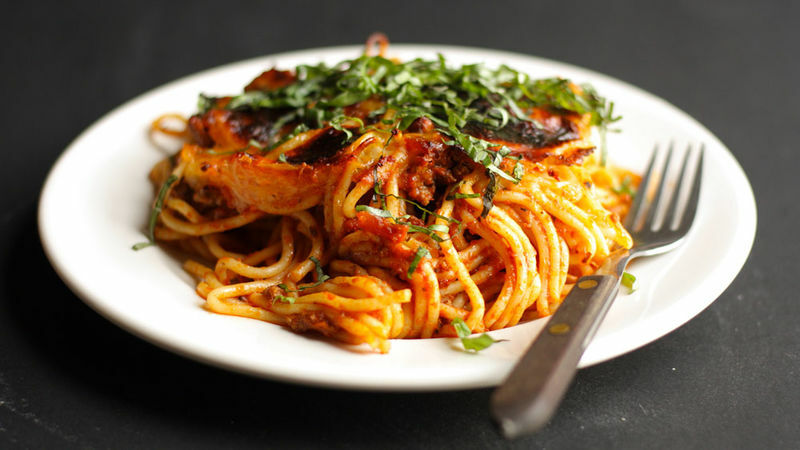 There are endless ways to make spaghetti. If you want to find a new favorite way to make it or learn how to perfect your old favorite, click here.